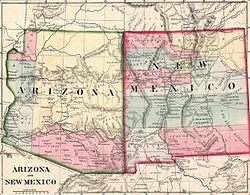 On February 24, 1863, during the Civil War, Congress passed the " Arizona Organic Act", which split off the western portion of the then 12-year-old New Mexico Territory as the new Arizona Territory, and abolished slavery in the new Territory. As in New Mexico, slavery was already extremely limited, due to earlier Mexican traditions, laws, and patterns of settlement. 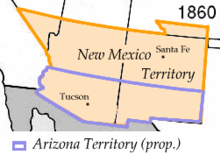 The northwestern corner of New Mexico Territory was included in Arizona Territory until it was added to the southernmost part of the newly admitted State of Nevada in 1864. Eventually, Arizona Territory was organized as the State of Arizona. The Purchase treaty defines the new border as "up the middle of that river (the Rio Grande) to the point where the parallel of 31° 47' north latitude crosses the same 31°47′0″N 106°31′41.5″W﻿ / ﻿31.78333°N 106.528194°W﻿ / 31.78333; -106.528194; thence due west one hundred miles; thence south to the parallel of 31° 20' north latitude; thence along the said parallel of 31° 20' to the 111th meridian of longitude west of Greenwich 31°20′N 111°0′W﻿ / ﻿31.333°N 111.000°W﻿ / 31.333; -111.000; thence in a straight line to a point on the Colorado River twenty English miles below the junction of the Gila and Colorado rivers; thence up the middle of the said river Colorado until it intersects the present line between the United States and Mexico." The new border included a few miles of the Colorado River at the western end; the remaining land portion consisted of line segments between points, including 32°29′38″N 114°48′47″W﻿ / ﻿32.49399°N 114.813043°W﻿ / 32.49399; -114.813043 at the Colorado River, west of Nogales at 31°19′56″N 111°04′27″W﻿ / ﻿31.33214°N 111.07423°W﻿ / 31.33214; -111.07423, near AZ-NM-Mexico tripoint at 31°19′56″N 109°03′02″W﻿ / ﻿31.332099°N 109.05047°W﻿ / 31.332099; -109.05047, the eastern corners of NM southern bootheel ( Hidalgo County) at 31°47′02″N 108°12′31″W﻿ / ﻿31.78378°N 108.20854°W﻿ / 31.78378; -108.20854, and the west bank of Rio Grande at 31°47′02″N 106°31′43″W﻿ / ﻿31.78377°N 106.52864°W﻿ / 31.78377; -106.52864. The Colorado Territory was established by the " Colorado Organic Act" on February 28, 1861, with the same boundaries that would ultimately constitute the State of Colorado. This Act removed the Colorado lands from the New Mexico Territory. 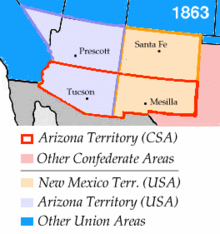 The creation of the Union Arizona Territory (two years after the ill-fated Confederate Arizona Territory) by the " Arizona Organic Act" on February 24, 1863, removed all the land west of the 109th meridian from the New Mexico Territory, i.e. the entire present-day State of Arizona plus the land that would become the southern part of the State of Nevada in 1864. This Act left the New Mexico Territory with boundaries identical to the eventual State of New Mexico for a half-century until admitted to the Union in 1912 as the 47th state (followed just under six weeks later by the Arizona Territory/ State of Arizona, which became the 48th state, finally filling out the coast-to-coast continental expanse of the United States). The Battle of Glorieta Pass in May 1862, following the retreat of Texan Confederate forces back south to El Paso, placed the area of the Rio Grande valley and eastern New Mexico Territory with the capital of Santa Fe under the control of the Federals with their Union Army. However, the government and leadership of the Confederate Arizona Territory persisted until the end of the Civil War in June 1865 with the surrender of the Trans-Mississippi Department, living in exile in El Paso, Texas with its delegate still in Richmond.